If you’re like me, makeup is a habitual part of your daily routine when you’re going out. Finding the perfect makeup that gives you a quick, earthly glow can be difficult, especially when you have sensitive skin and are worried about harsh chemicals! 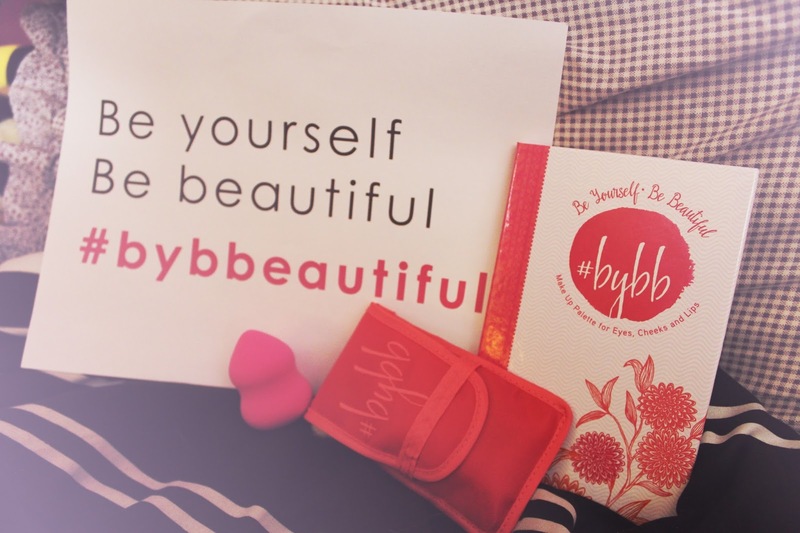 I am excited to share with you my results of trying out the awesome online brand Be Yourself Be Beautiful. An amazing palette, awesome brushes, and a spectacular beauty blender! As always before I start off, I am going to embed my YouTube video that is the equivalent to this blog post. On my video you can see me unboxing my package from #BYBB as well as doing a tutorial of my daily makeup routine! If you’re still reading, HOORAY! I also have some quality pics of the product as well which I will share with you on this blog post. One of my favorite things about this online brand is that they have a message. They’re empowering young girl, and their main target audience is for young girls who seem to just be learning about makeup. HOWEVER, I still love this makeup myself. The colors were so pigmented, and the brushes were extremely soft my skin. The brushes come in an adorable case, and what I loved most about the brushes is that they are labeled for what they are used for, which can be great for a makeup novice and experience do-er alike. The brushes are synthetic as well, which was excellent for my sensitive skin! I took this picture of my brushes right after I finished filming my tutorial of my daily makeup routine (linked above!). I promise I cleaned them afterwards — but this picture shows just how pigmented the palette really was! The shocking thing? The colors were still very soft and subtle. Pigmented, and subtle, who knew the two could go together? I sure didn’t. First I started off with contouring my face using their color “Summer”! For this I am using their “cheek” brush. I go in a downward motion along my cheekbone, under my jawline, and finally along my outer hairline on my forehead. Quick tip: think of going in a motion that looks like the number 3. Outer hairline, cheekbone, jawline! What’s so great about this palette is that it has all the essentials. Next I used “Crush” to add a highlight to my cheeks, nose, chin, and forehead! Again, I am using their “cheek” brush. It really gave a nice glow to my skin without looking unnatural! Next I started on my eyes! I began applying their color “Star” over my eyelid as well as my brow bone beneath my brow. For this one I used their “eye shadow” brush! This color was excellent for setting a base on my eye and adding a highlight! To add some shadow and definition to my eyes, I used “Glow” on the crease of my eye and then blended it outward across my lid. Again, I used their “eye shadow” brush. It’s super soft! To make “Glow” look more blended, I used “Sand Dune” across my eyelid gradually! I love how soft and matte this color was (probably my fave!). And you guessed it, I used the “eye shadow” brush for this, too! For the final part of my eye, I used “Gossip” as an eyeliner. I used this color close to my lashline. For this, I used their “eye liner” brush! Quick tip: if you want to make this color appear more opaque / dark, try getting your brush wet! To finish off the look, I used the lip color “Smooch”! I love it’s ligh and airy color. It’s not too glossy, either, which is something that’s great in my opinion! For this, I used the “lip” brush! Quick tip: line your lips first, and then fill in with color — this helps make your lip color look less messy! I seriously loved trying out this makeup. I promise I’m not just saying that, either, you’ve got my guaruntee! I love how soft and subtle the colors are while highlighting my features. I can’t wait to experiment with this palette to see what I can come up with! Let me know in the comments what you thought about this makeup! Previous UNBOXING & REVIEW: Kawaii Box! AND GIVEAWAY! Next UNBOXING: November Tokyo Treat – a Japanese Candy box!